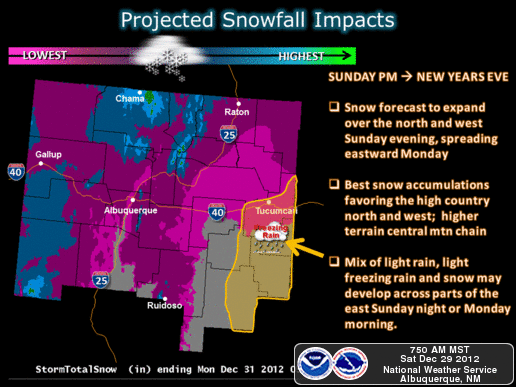 Complicated Winter Storm Taking Aim On NM! 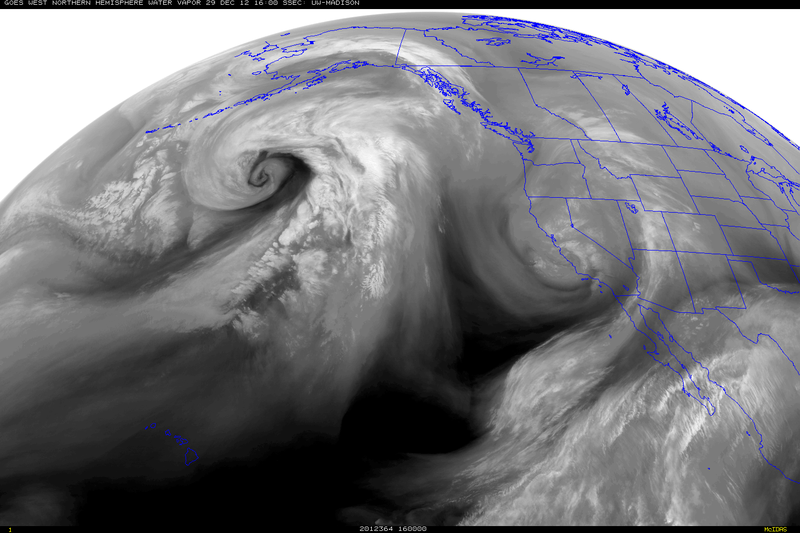 This Mornings Water Vapor Satellite Image At 9 AM MST. Last Nights 00Z/5 PM MST ECMWF 500 Forecast. 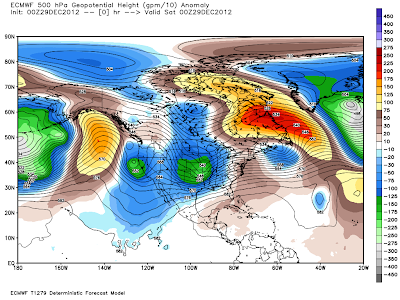 Valid At 5 PM MST Wednesday January 2, 2013. Looking at the Water Vapor Satellite Image posted above, you can see that a Winter Storm was located over Central California this morning. 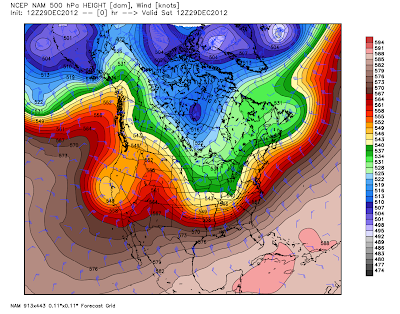 This is also depicted by the models (the ECMWF last night, and this mornings GFS, and NAM). This is about at far as the models go as far as agreement on the future track and strength of this storm. They generally agree that this first storm will swing east across Arizona today into tomorrow, and into northern New Mexico on Monday. To varying degrees they then want to forecast a second short wave trough to drop south over the Desert Southwest by around New Years Day. What happens after that is highly uncertain at this time. Valid At 11 AM MST Thursday January 3, 2013. Compare the differences in the position of the 500 millibar low depicted by the maps above, they vary by some 800 miles. That's crazy. Last nights European (ECMWF) model was still having trouble with the position of the low, as was this mornings run of the GFS model. 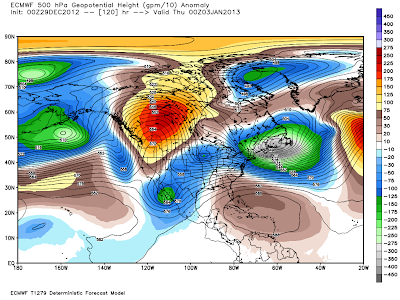 The ECMWF wobbles it all over the place, finally settling it into northwestern Mexico by Wednesday. The GFS wobbles it all over the place too but with a more northerly track, eventually settling it in over Colorado by Thursday. Again, the exact track of this mid-upper level low will be crucial to who gets what, how much, and when in the area. If the GFS is right and the storm takes a more northerly track, then the heavy snows, and colder air will remain over northern New Mexico and Colorado. If the ECMWF models forecasts pan out, and the storm takes the southern route, then most of New Mexico will see a Winter Storm and snow. 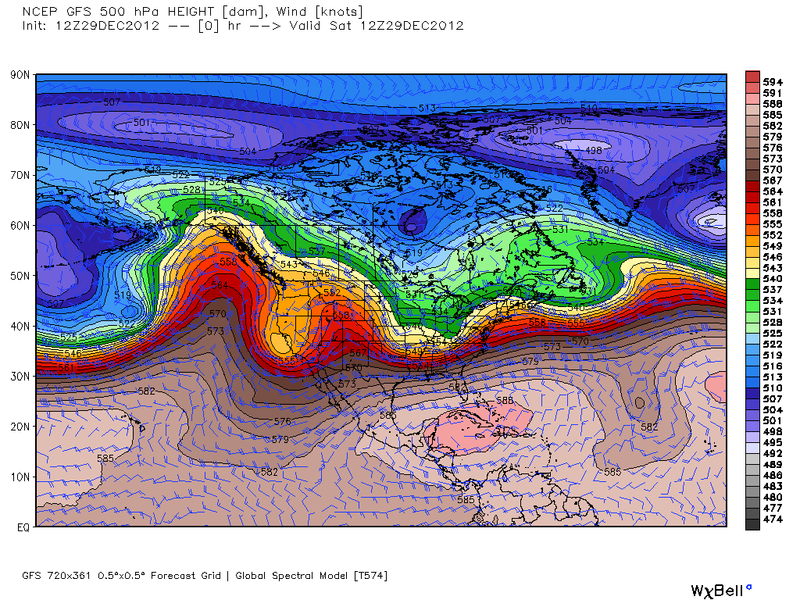 Valid At 5 PM MST New Years Evening. 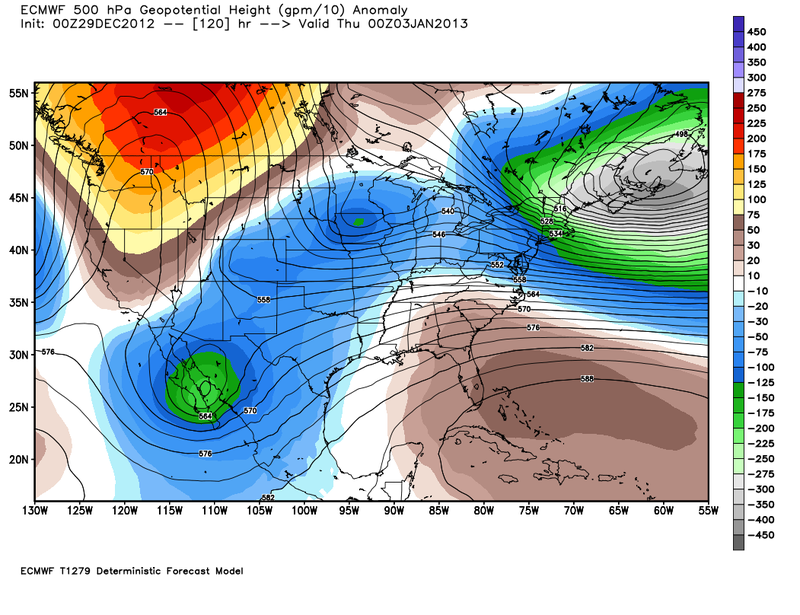 I still think that the ECMWF model may have the better idea with a more southerly track of the storm. 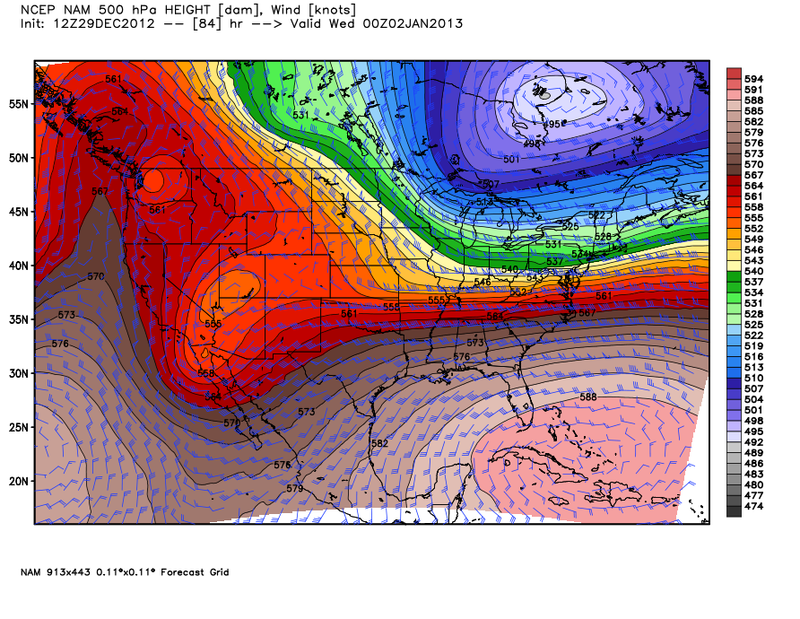 I am leaning towards the ECMWF forecast in part because of this mornings run of the NAM model. 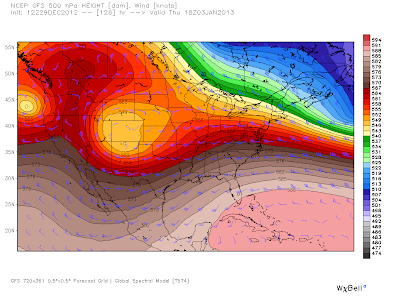 It starts closing off a strong mid-upper level low (closed low or perhaps even a cutoff low) over northwestern Arizona by around sunset New Years Day. This would favor more snow and colder temps for New Mexico. If we see a deep and cold closed or even a cutoff mid-upper level low drop into northwestern Mexico by mid-week, then there is the potential that what the European model was forecasting a couple of days ago may not be that far off. That includes local temperatures diving below freezing and staying there for five or six days, and lots and lots of snow, not only for southeastern New Mexico and west Texas, but the rest of New Mexico and parts of Arizona too. Please refer to the blog I posted on Thursday via this link. The computer model forecast waters remain as muddy as ever. Therefore what lies ahead this week is basically questionable, and subject to lots of changes. 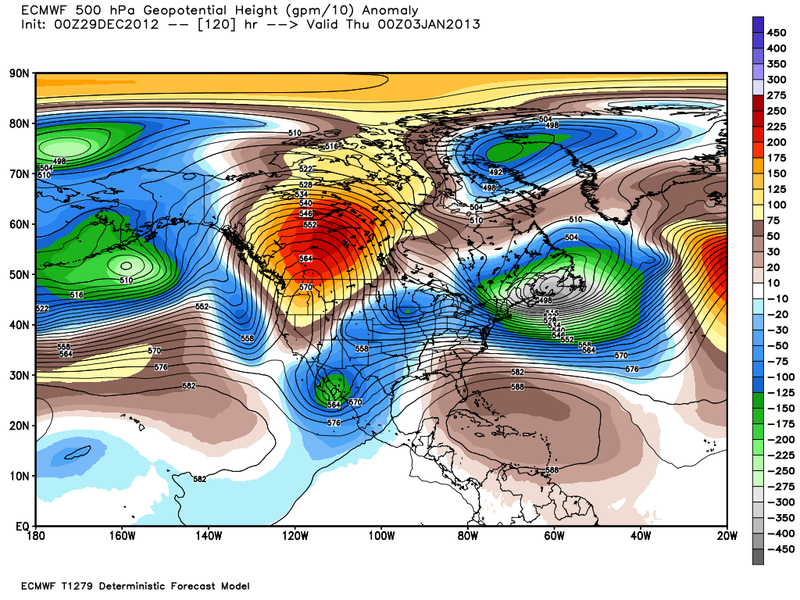 I'm still waiting on the models to settle down and offer a more reasonable forecast solution to this mess. Latest NWS Special Weather Statements. Special NWS El Paso Web Briefing.